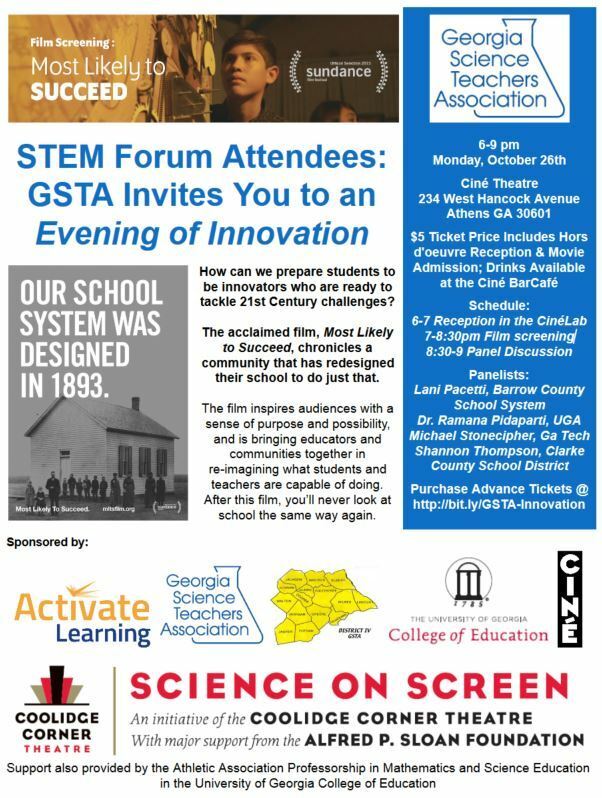 Please purchase your $5 advance tickets here: http://bit.ly/GSTA-Innovation. Ticket purchases at the box office will be limited and dependent upon availability. Tickets will entitle you to attend the catered reception, film screening, and panel discussion. The reception will feature hors d'oeuvres from Pulaski Heights BBQ. Drinks will be available for purchase from Ciné's BarCafé. You can learn more about Most Likely to Succeed by visiting the film's website at http://mltsfilm.org/. The Panel Discussion will feature the following distinguished professionals. Lani Pacetti - Ms. Pacetti is a science Instructor at the Sims Academy of Innovation & Technology in Winder, GA, a career and entrepreneurship academy open to all high school students in Barrow County, and she teaches Environmental Science, Chemistry, and Essentials of Biotechnology. This is Lani's 10th year of teaching, after studying as an Animal Science graduate student at UGA Tifton and working in the dairy industry prior to graduate school. While a graduate student in Tifton, Lani was part of a National Science Foundation fellowship where she had the opportunity to work weekly in a science classroom at Turner County High School. Lani most enjoys helping my students explore the world, to think critically about modern science issues, to be thoughtful individuals, and to be professionally prepared for the workforce. Dr. Ramana Pidaparti - Dr. Pidaparti received his Ph.D. degree in Aeronautics & Astronautics from Purdue University, West Lafayette and currently, he is a Professor and Associate Dean for Academic Programs in the College of Engineering at the University of Georgia. Previously, he has been on the faculty at Virginia Commonwealth University as well as the Purdue University School of Engineering & Technology at Indianapolis. Dr. Pidaparti’s research interests are in the broad areas of multidisciplinary design innovation, computational mechanics, micro/nanotechnology, and STEM education. Mike Stonecipher - Mr. Stonecipher is a project manager for Georgia Tech’s Enterprise Innovation Institute. He specializes in strategic planning and managing projects that will enable top-line growth through product innovation and deliver bottom-line results through process innovation, team development, and lean implementation. Prior to joining Georgia Tech, he served 15 years in the automotive industry with AlliedSignal and Honeywell International. Stonecipher also worked in the energy and sustainability industry and has served on the board of directors for Power Partners, Inc. He has extensive experience in leading product and process development, six sigma and lean implementation, factory start-ups, new product launches, and managing operations that serve a global OEM customer base. He was awarded AlliedSignal’s CEO Technology Achievement Award and received a patent for abrasive coating on brake pads. Shannon Thompson - Mr. Thompson is the school librarian at Howard B. Stroud Elementary School in Athens, GA. In addition to lessons in the library throughout the year, Shannon also leads a S.T.E.M. enrichment class for students in grades 3-5. Students who take part in the S.T.E.M. @ Stroud class learn about 3D printing, coding, robotics, and more. Before becoming a librarian, Shannon was a classroom teacher for five years in the Clarke County School District. This is his 12th year as an educator and his 10th in CCSD.